« Fridays With Isaiah: Chapter 6 – I’m Glad I’m Not Called To Preach His Sermon! The assassination of President Kennedy and all the images associated with it can’t be forgotten by those of us who experienced it. Just the phrase grassy knoll can only reference one bloody event. Pink dresses and pill box hats or a small boy in his winter coat stepping out of the crowd to salute his slain father–words and images become iconic with the depth of emotion they arouse. I first remember Eternal Father, Strong To Save from the funeral of President Kennedy. The Navy Band played it as they carried his coffin into the capital building to lie in state. My memory is that the hymn was played in the processional to Arlington cemetery as well. In fact, I remember no other music—that’s how deep the impact of this hymn was on me at that time. The music was written by John B. Dykes in 1861, specifically for the words of the original lyrics which were a poem composed by William Whiting in 1860. Whiting wrote the words on behalf of a student of his who was going to sail to America. The trip to the United States in 1860 usually took six weeks, but storms and high winds could extend that time to as much as fourteen weeks, in which case food became short and disease became an issue. And, of course, shipwreck was not rare. From 1847-52, 43 emigrant ships to the U.S. from England wrecked and over 1000 passengers lost their lives. Whiting’s student must have certainly appreciated the prayer. John Dykes named the tune Melita, which is the ancient name for the island of Malta. You will also remember that it is where Paul shipwrecked (Acts 27)—one of the three times (2 Corinthians 11:25), so the connection of the tune to the words is very apparent—as it should be in great hymns. In 1879, Rear Admiral Charles Jackson Train began the tradition of closing the Sunday service at the Naval Academy with the first verse of this hymn. That may be how it has become to be known as The Navy Hymn. It was also the last song sung at the April 14th Sunday service of the Titanic. Interestingly, the other hymnal melody associated with the Titanic Nearer My God To Thee was also written by Dykes. The sea has always been understood to be a dangerous and scary place. Monsters arose from the sea! Storms rolled inland from the sea! Those who sailed the seas were considered short-lived! Just think about the story of Jonah: storms and great fish! The darkness of the night sea, the raging and thunder of waves—no wonder men were afraid of the sea! The prayerful protection for those on land and sea petitioned in this hymn has been extended to airmen, astronauts, special combat troops—almost all kinds of combatants—by additional verses written especially for different groups of military personnel. 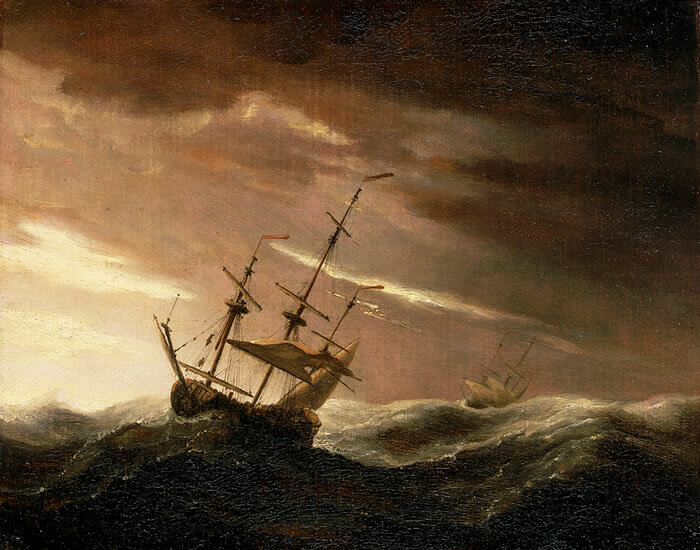 For those of us who travel a lot, the hymn is of special comfort because when you are on the middle or over the middle of an ocean in the middle of the night, you realize how powerless you are against the forces of nature and how much our lives depend on the grace of God. Thank you for this series and your thoughts, Mark.